If you are reading this you might be like me: looking for a strong smack of inspiration to hit you in the face. Homeschooling can be monotonous. It is the same thing in and out. It is tiring, at times boring. And I am CONSTANTLY re-evaluating and re-inspiring myself. Sometimes that means getting together with another homeschooler and talking about what is working for us/what isn’t. These days getting together with anyone is nearly impossible so for me, inspiration looks more like googling pictures of homeschool set ups. Or reading different blogs/sites as I desperately try to “find a better way”. Or “the answer to all my troubles”. In truth, I don’t think said answer really exists. The reality is that whether your kid is in school or at home, it is never going to be a walk in the park every day. There are hiccups, bad hair days, emotional days, over tired days, grumpy days, and just plain LONG days. But alas, I continue to search for this ever-elusive answer. All right, enough with the flowery stuff, lets get down to it. I have found something that although may not be the answer to eternal happiness, I sincerely hope it will revolutionize our homeschooling experience. My biggest challenge with 5 kids is lack of organization. In the fall I read “Managers of Their Homes” and tried to organize our day a bit better. I wrote out a schedule for every member of our family (excluding Jonathan). And we lasted for a few months and fizzled out. But the problem still exists. I am trying to do school with Caleb while Selah is crying because I’m “taking too long” to help her and Aliyah is whining at my feet and Malakai is playing cars across the room and my school room is a mess of papers and books are everywhere and I want to scream! I have resorted to doing school in other rooms of the house in order to get away from the complete lack of organization in my school area. So, I started off by reading a post on one of my all time fav. homeschooling sites, confessions of a homeschooler. It is about workboxes. You can find the link on her post here. So I went to Amazon.com and made the jump, I can’t wait until they come in! 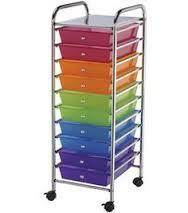 You can purchase them by clicking on this link 10 drawer organizer cart . She also has all the printables for the workbox system on her site which I printed off and am laminating. I am hoping that as the kids can see what they are working on, see what they are accomplishing, and I can arrange it all so that it is a bit more conducive to the natural flow of our day. Essentially the workbox system is a way that the kids have each thing that they need (pencil, blocks, paper, book, etc) in a separate workbox. They have a little schedule in front of them and work through their day accordingly. There are little “ask mom for help” stickers which are on the front of the boxes they need help on. Which is great because then I can put Selahs in a different place then Calebs thus not having one waiting on the other all the time. My second issue, scheduling, will be partly repaired by the workbox system. However school really should only take us a few hours, leaving a lot of time in the day to fill up. So I sat down and re-did a family schedule. This time I get to include Jonathan with gives lots of time for us to do what we want in a day. I then sat down and totally revamped the school room. Cleaned out the bookshelves, organized the different hands on things into different bins, etc. This has helped me be a lot more excited about doing school in the morning and I am looking forward to implementing the schedule this coming week and the workbox system hopefully in a few weeks. IF you are one of the hardworking, run down, homeschooling moms like me who is looking for a little bit of extra “oompf” in your school day, check out the post I linked to above. Even if you don’t decide to do the system, it will give you some perspectives and ideas and her page is so fun to browse through.